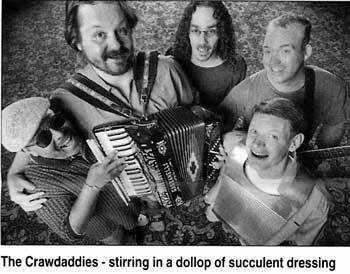 While a lot of roots-rock bands these days claim to be a boiling gumbo of spicy sounds, the oft-uttered adage fits the Crawdaddies so well, it's too silly even to mention it. The Baltimore-based, accordion-centric quintet seemingly has no limits, stirring in heaping portions of reggae ("Gimme Some"), swing ("Carolina Baby"), swamp rock ("Habit Forming"), hot Chet Atkins country ("The Difference"), and even a dollop of zydeco in the most original, succulent combinations. As this gutsy fusion and eclecticism can go flat faster than homemade beer if it's not brewed properly, the Crawdaddies unfailingly tap infectious melodies and lyrics supported by a steady stream of screaming guitars, flashing accordion playing, and an unfaltering dance sensibility, regardless of the stylistic dressing. The stories are cool ("Betty Says"), the songwriting's smart, and the arrangements are notch, like "Pump That Thing," which kicks off like an old-school Clifton Chenier number before evolving into its own entity. These guys have the whole package, and guaranteed, it's one that can't be broke.